In my previous post on microfinance in Sri Lanka, I described the role of the animator, the person who goes into the rural villages to convince women to give up their traditions of working together and instead establish individual microbusinesses. We saw how small borrowing groups are used to mitigate the risk of loan defaults, creating a mechanism for the women to monitor each other and to encourage each other to adopt the financial disciplines of saving, accounting, and repaying their loans. In this post, we’ll look at the second tactic used to establish microfinance in Sri Lanka. We refer to this as “corporatizing” the village, turning the entire village into a hierarchical structure that reports to the bank. This effort has been led by the Sri Lankan Ministry of Economic Development, not the individual banks. 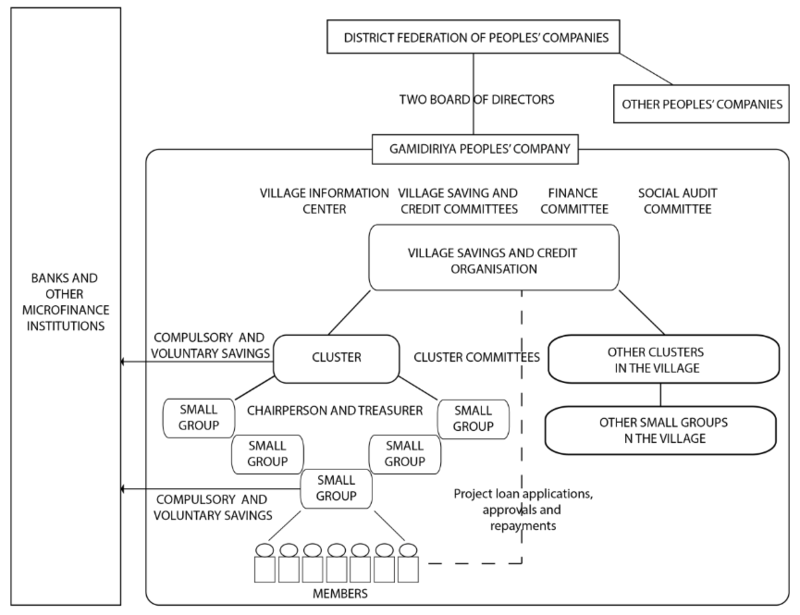 The project for transforming villages into hierarchies is called Gemidiriya (“Village Strength”). Just as the women are gathered into small borrowing groups, the borrowing groups are gathered into clusters, and the clusters are gathered together to form the Village Savings and Credit Organization. The small group is thus the building block for corporatizing the villages. Each group has a constitution designed and prescribed by the Gemidiriya project officers. The constitution sets out the aims of growth and development, and describes the potential for villagers to make a positive contribution, individually and collectively, towards the nation’s development goals. The constitution also sets out the penalties for deviant behaviour, such as financial fines for missing group meetings and training sessions, or for not doing the accounting correctly for their microbusiness. The constitution is both an operations manual for how to run the group and an ideological tool for how to conduct oneself as a responsible entrepreneur. The group’s constitution establishes it as a “village society” with an elected president, secretary and treasurer. The treasurer keeps the group’s cashbook under the guidance of the animator, recording all receipts of membership fees and loan repayments, and all cash outflows including expenses and loans to members. The cashbook serves as the focus of conversations and discussions during meetings, mobilizing the numbers it contains and connecting them to past behaviours and future possibilities. This gives the cashbook a significance that extends beyond the meetings into the lives of the women. In addition to performing these economic rituals, the group members talk at the meetings about the social factors related to their finances: education for their kids, important upcoming ceremonies, rising prices. The network of relationships between group members ties their financial decisions to their social needs. The fundamental neoliberal assumption that individuals make free and independent economic decisions doesn’t really apply here. Their decisions are always made in the context of the support and the expectations of friends and family. Microfinance, as a quintessentially individualizing tool for governing the poor, depends deeply and paradoxically on the social connectedness of one villager to another. One or two members represent each group at the cluster level, and representatives of the clusters come together in the Village Savings and Credit Organization. This organization also participates in regional committees for finance and auditing. In this way, the entire village is harnessed to the yoke of microfinance. The individual borrowers, who monitor and encourage each other in financial discipline, are assembled into a hierarchical form that enables the biopolitical governance of the village. This turns the entire village into a machine not just to generate economic activity, but to produce financial profits for the banks. This disciplinary apparatus also works to convert the social and cultural capital of the women—the relationships of kinship and friendship—into “collateral” for their loans. The formal, hierarchical structure is like a skeleton enabling these relationships to serve as collateral. The structure allows the banks to monetize the women’s social relationships and turn them into bank profits. Tracking these profits depends on a system of record-keeping taught to the microborrowers, which provides data that can be assembled into accounting reports. This system is the final tactic by which microfinance has been established in Sri Lanka. We’ll look at it in the next post.